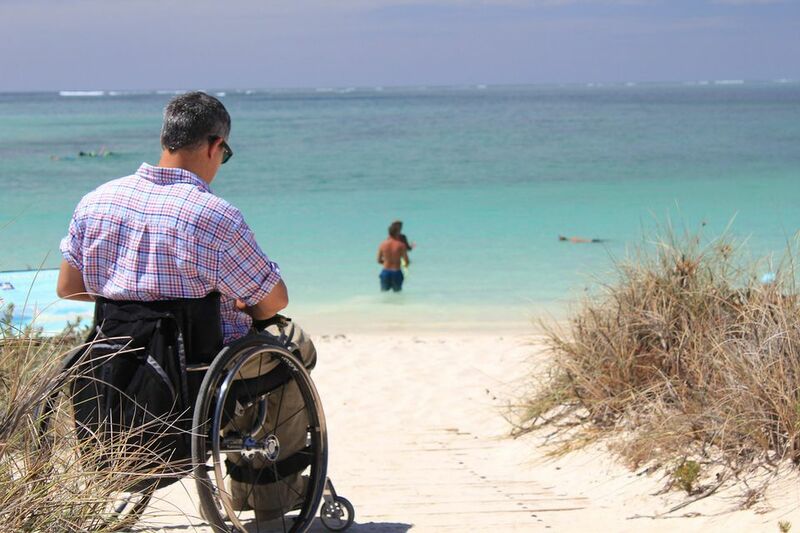 The Caribbean is one of the most popular vacation destinations in the world for disabled travelers, but not all Caribbean islands are created equal when it comes to accommodating visitors who are handicapped, in a wheelchair or have limited mobility. Here are some tips on planning a Caribbean vacation that's as accessible as it is enjoyable. Cruising is one of the most disability-friendly ways to travel, and most cruise lines have made special accommodations for handicapped and mobility-limited passengers. Not only have cruise ships traditionally served an older clientele -- who tend to have more mobility issues -- but U.S. law requires cruise ships operating in U.S. waters to comply with the ADA. When picking a cruise itinerary, look for port calls with docks that can accommodate large cruise ships, since tendering from the ship to shore can be an obstacle for some disabled travelers. Some cruise lines offer special accessible tour packages. Puerto Rico and the U.S. Virgin Islands are ideal Caribbean destinations for travelers with mobility restrictions or in wheelchairs for one simple reason: since these islands are part of the United States, hotels here must comply with the Americans with Disabilities Act (ADA), so you'll find wheelchair ramps, elevators, and handicapped-accessible bathrooms just like in the U.S. The same standards apply to other public places, such as museums. Puerto Rico also is home to the Sea Without Barriers at Luquillo Beach, an ADA-compliant facility that includes a paved path leading to a semi-submerged platform that allows people in wheelchairs to experience the warm waters. Wheelchairs specially designed to enter the water can be rented for the day, and the beach also has accessible bathrooms, showers, and other facilities. Other Caribbean islands with a reputation for accessibility include Barbados, which recently launched its island-wide Fully Accessible Barbados initiative; Aruba, Jamaica, and St. Martin. Nearly every U.S. airport unloads aircraft via wheelchair-friendly jetways, but that is hardly the case in the Caribbean. At many smaller island airports, passengers get off the plane the old-fashioned way, by climbing down a staircase, which poses obvious challenges for disabled travelers. Also, shorter hops between islands often take place on aircraft that are quite small and may not be able to accommodate a wheelchair. If you're not flying to a big airport like San Juan, Kingston, or Nassau, make sure you check out the facilities before you fly. The Society for Accessible Travel and Hospitality has links to airline accessibility policies online. First, get travel health insurance that provides for emergency medical evacuation when necessary. In the Caribbean there are vast differences in healthcare quality from island to island -- and an equally big gap between the care offered to wealthy clients at private clinics and that available at public hospitals. Many smaller islands have no hospital or clinic at all -- some even lack a doctor. The U.S. State Department's Bureau of Consular Affairs has healthcare information on Caribbean destinations, as does the Centers for Disease Control and Prevention and the Travel Health and Safety section of my website. The travel agent business has become increasingly specialized, and a number of agents now have special expertise on planning trips for travelers with disabilities. Agencies like AbletoTravel, Connie George Travel, and Special Needs at Sea focus on special-needs travelers. Disabledtravelers.com and Access-able Travel also have links to some of these specialty agents. International hotel chains with roots in the U.S. may be your best guarantee for ADA compliance in the Caribbean. On the other hand, we have been to too many Caribbean hotels that lack elevators or are built over such rough or sloping terrain that makes wheelchair access difficult or impossible. On the other hand, hotels like the Amaryllis Beach Resort in Barbados have been designed to be ADA compliant and handicapped accessible. Before you book, be sure that your hotel can accommodate your needs. A number of online resource centers for disabled travelers include databases of hotels worldwide that are handicapped-accessible, such as Travel Intelligence.com's list of accessible Caribbean hotels.